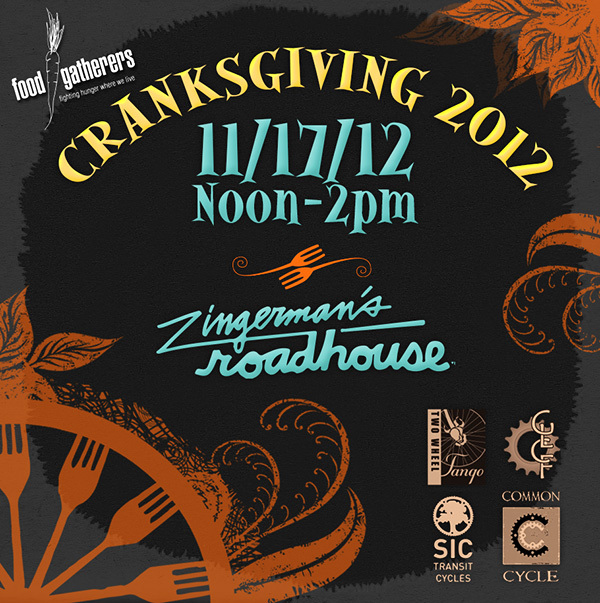 Cranksgiving is a food drive by bike benefiting Food Gatherers of Washtenaw County. The event will be held 11/17 from 12 p.m.-2p.m. at Zingerman’s Roadhouse. Riders will be given a shopping list and a map to local grocers. Participants are allowed as many runs as they want within the 2 hours. When you’re finished you can weigh in and see who hauled the most. Prizes and support provided by Two Wheel Tango, SIC Transit, Great Lakes Cycle and Fitness, Common Cycle and Zingerman’s Roadhouse. Bring a bike, yourself, a bag, and a lock!